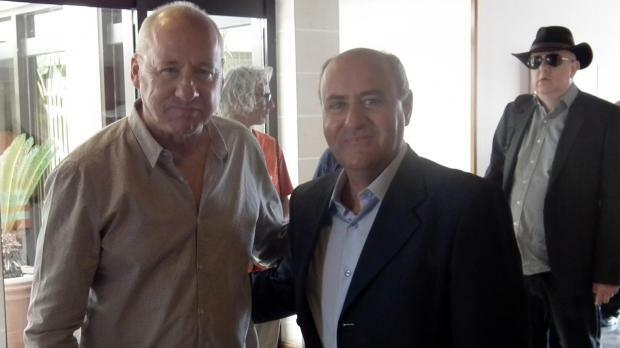 Rock legend Mark Knopfler arrived in Malta this afternoon ahead of his open-air concert tonight at the Floriana Granaries. He was greeted by Parliamentary Secretary Jose' Herrera. The multi-Grammy Award winner is nearing the end of a 25-country tour to promote Privateering, his latest solo album that fuses blues, folk and country music. It is the first double album of his 36-year career, which began in 1977 when he founded rock band Dire Straits with his brother David. Dire Straits had worldwide success with rock classics such as Sultans of Swing, Money for Nothing and Romeo and Juliet before Knopfler went solo in 1996. Despite tickets still being available, music journalist Michael Bugeja insisted Knopfler is still very much a crowd puller. Mr Bugeja expected Knopfler to play his solo material tonight as “he is still very active and creative”. Nevertheless, there will certainly be some Dire Straits hits performed as they are part of Knopfler’s legacy, Mr Bugeja said. Tim Ellis, frontman of local band Stalko and events organiser at Coach and Horses pub, said he was not particularly impressed by the little he had heard of Dire Straits. Mr Ellis pointed out it was very hard for music promoters to make a profit on the island unless bookings had mass appeal, and the music fans with disposable cash were usually those aged 40 and above. Beangrowers vocalist and guitarist Alison Galea expected the Maltese to be out in force as classic rock is a favourite genre on the island and Dire Straits were very popular. Subscribers to timesofmalta.com Premium Content who are fully paid up after their two-week trial are eligible for one free ticket each. Tickets can still be bought online from http://ooii.com.mt/ . Standing tickets cost €35, gold tickets €75 and platinum tickets €150. Tickets can also be bought from a booth near the Independence monument. Gates open at 8pm and Knopfler is expected on stage at around 8.45pm.